Make DutchCrafters your first stop for your next bathroom remodeling project. Handcrafted in the popular Mid Century Modern Style, this stunning bathroom vanity will add a hint of sophisticated charm to your bathroom. With double "his & hers" sink bowls, this handcrafted vanity is perfect for your dream master bathroom oasis. The concealed under mount soft-closing drawer slides and door hinges allow for smooth movements with no loud closing doors or drawers. 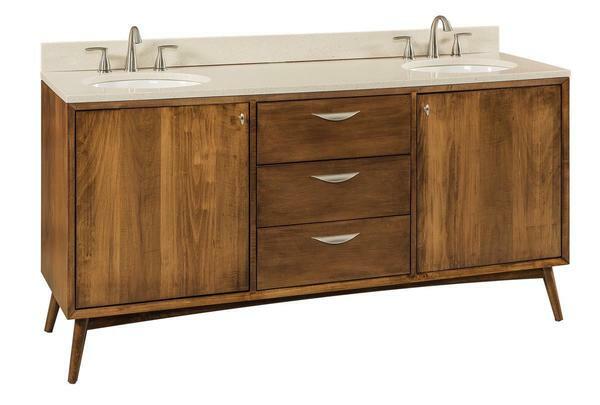 Shown in solid Brown Maple wood with Chocolate Spice stain and a Moon Haze solid surface top, this Mid Century Vanity will look great in any modern themed bathroom. Choose this same wood & finish combination for your bathroom vanity or select a custom wood and finish of your choice from our variety of wood & finish options that will match your personal style or home decor. We also offer an attractive selection of vanity tops that include both granite and solid surface designs. Finish off your new bathroom vanity with a standard or low sheen varnish! Contact one of our Knowledgeable Amish Furniture Consultants for additional information or custom ordering assistance on this Amish Mid Century Bathroom Vanity. Call toll free today - 866-272-6773 or email us at Questions@DutchCrafters.com. Yes I got it and worked beautiful. Thanks for tracking it down for me and the follow up. Great customer service, hope I can save up and order some more pieces from you, just gorgeous!